Jesus said, "I tell you the truth, Moses didn't give you bread from heaven. My Father did. And now he offers you the true bread from heaven. The true bread of God is the one who comes down from heaven and gives life to the world." Bread is the "staff of life" in many countries. But physical bread can sustain only the physical body and for only a short time. Heavenly bread sustains long term. It gives genuine life. Why? Because it has come from heaven! Jesus is that true bread. He alone sustains forever. When our lives are joined to Jesus, his glory and his life become our own. 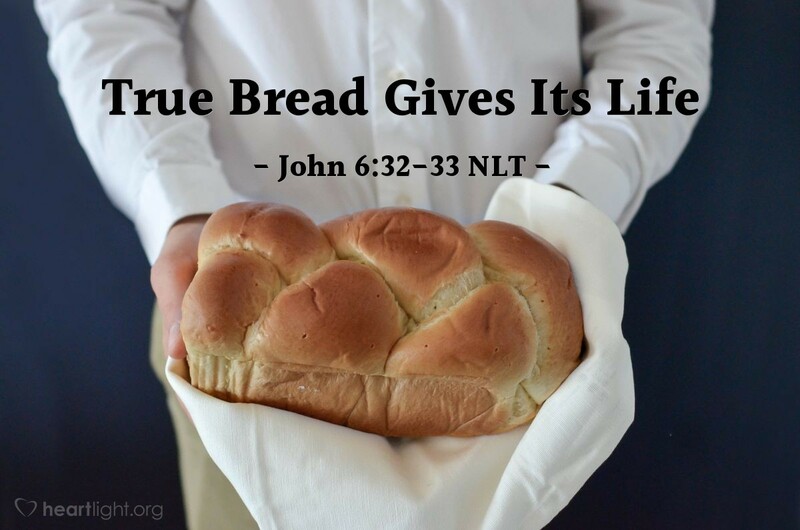 Thank you, dear God, for giving me true bread. Only you can feel the hunger I feel in my soul. I come to you to be sustained and fed. Only you bless with the bread of life, in whose name I thank you. Amen.